Hi, my first post. 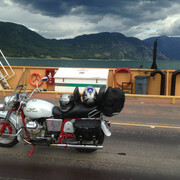 Pics of my eldo and 1 pic of my much modified Lemans, I’m a mechanic / machinist/ welder and a life long motorcyclist. They are my life and will be until the end. Your Eldorado with the red paint on the frame looks wonderful. 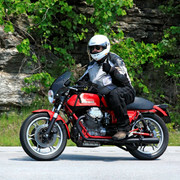 and welcome to WildGuzzi, best source of all things Guzzi bar none. Nice work.. attaboy.. and Welcome to WG..
Hi 73, I was one of the wise guys giving you a hard time for the Harley parts on your Eldo. I voted for it anyway Glad your here. Glad to have you at WG! Beautiful bikes btw. If you ever plan a trip to the Island, look me up! welcome and thanks for the bikes and photos of the bikes. 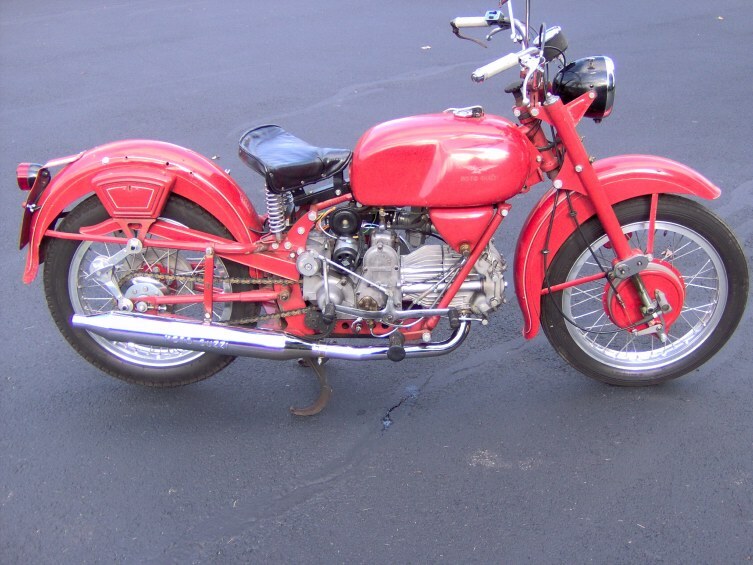 I too remember the red frame Eldo at the Oregon Rally.......nice. Finally got mine finished too. I live just a little south of you at Kingsgate. Stop in if in the area. Hi, my first post. 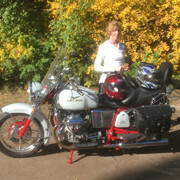 Pics of my eldo and 1 pic of my much modified Lemans, I�m a mechanic / machinist/ welder and a life long motorcyclist. They are my life and will be until the end. 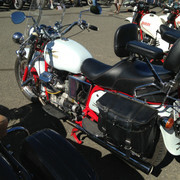 Thanks for the warm reception, I had no idea that there was so many Guzzi freaks so close to me and best of all they own loop frame bikes. I saw my first Eldorado in 1973, I was 16 years old and had no idea of what it was or where it came from. 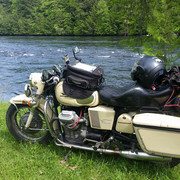 I got my first guzzi in 1986 and I still have it, a 1981 Lemans II, up here in Canada we got the 850 version and the states got the 1000cc model. 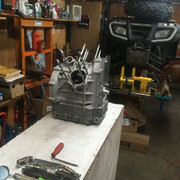 I was repairing motorcycles for a living and worked on all brands, one of my customers named Bill was getting his logging truck repaired in Cranbrook and got in a conversation with the service manager about motorcycles. Bill found out he had a Eldorado and gave the him my number, he phoned me for info and we had a hour long conversation that ended with me telling him that if he was ever going to sell it to let me know. He said he was never going to sell it, I told him that I can respect and understand that. It was a couple of years later I got a call and he said I�m getting a divorce are you still interested in the Eldo. 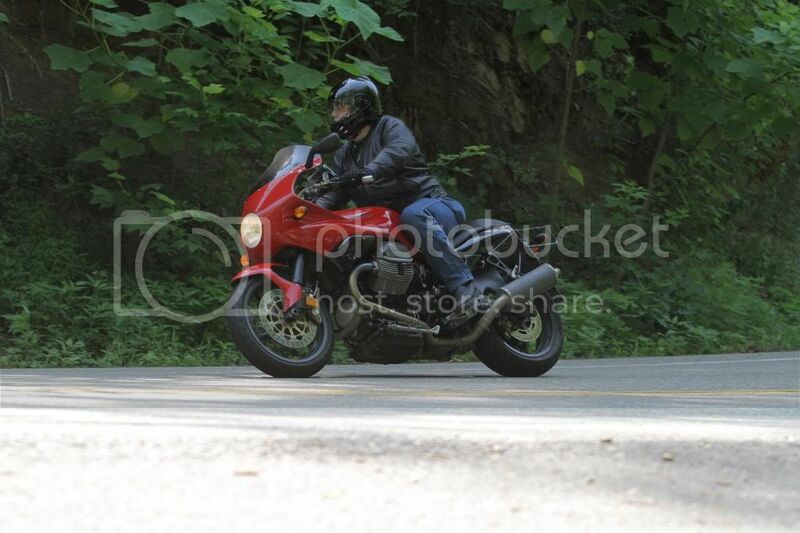 As you can imagine I leaped at the opportunity, closed the shop and drove 3 hours to buy the bike. It was torn apart and in boxes, everything I looked at needed repairing or replacing. He wanted $500, since I had seen a Eldo since 1973 I decided to buy it, when I got home my wife Linda, looked over the side of the deck down at my prize and said �what are you going to do with that piece of s#it. I said I have a vision to which Linda said �more like a f##ing nightmare� slammed the door and went in the house. In her defence we did have 3 kids, I was road racing and drag racing, mortgage etc. We weren�t starving but I may have had a few to many bikes or projects!! It took me 12 years to get it on the road, sometimes I didn�t do anything to the eldo for a year or more, I wasn�t going to do any short cuts so it would turn out perfect. Since then it has got 25000 trouble free miles and runs like a old tractor chugging along, its at its best on secondary roads at 60 MPH. 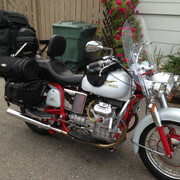 I took my 12 year old son to San Diego on it and ridden over a lot of the western states. I bug Linda about the so called piece of s#it comment and we have a few laughs about that!! 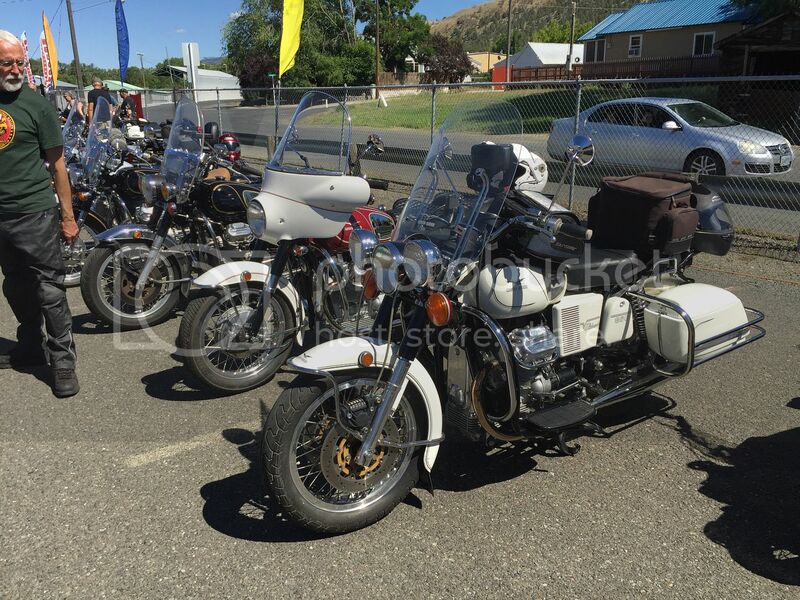 I look forward to going for some rides to seeing some of these old bikes and their owners in the future, if your coming through Golden give me a call as I would love to see you. What color is your tank. Is it pearlesque type paint? Hi Les, yes it’s pearl. In the sun it looks fantastic, when I took my parts in for painting I was torn between the pearl white and a jaguar green ( can’t remember the exact name ). I think that I made the right choice as it goes real well with the red frame and chrome. 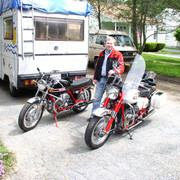 The V7 Sport lives in NJ now and the Ambassador/V7 Special in Oregon. Hi Charlie, Amen to that. Welcome Al.....and to repeat, those red framed bikes are gorgeous. You did a fabulous job! I have a 1973 Eldorado also, original patina. This is a great site with great people. I resurrected mine after sitting for 35 years. 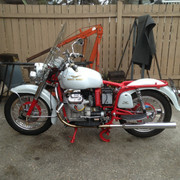 Could not have done it without the Guzzi community. Hi Nick, LMAO!! In my neck of the woods most people look at my Eldo and say what is that? Do they still make them? 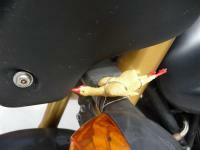 Our area is full of HD�S which are more common than Honda�s. 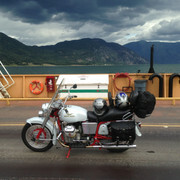 I am lucky that a fellow who bought a Eldo in Invermere brought his bike to me to make it mechanically sound. 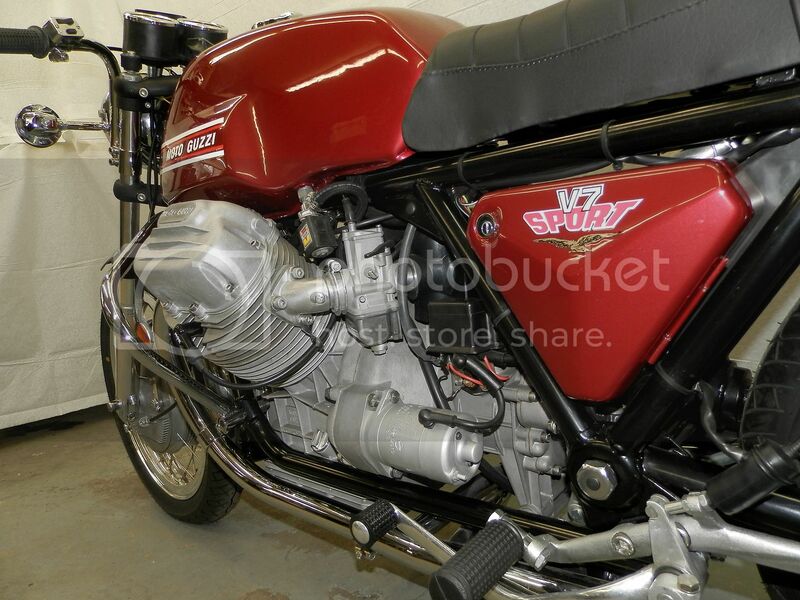 Usually I get everything but Guzzi�s. 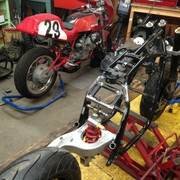 I will post more photos in the rebuild section, oh by the way if you make it out this way give me a shout out. I may have to stop by next time I swing through. That is gorgeous country! Love the paintjob on the loop, could you share a bit more about that LeMans racer?